Orlando is currently hosting the International Association of Amusement Parks & Attractions Expo, the tourism industry’s largest trade show in Orlando. The IAAPA Expo runs from November 14th through the 17th and provides companies in the field an opportunity to highlight their technology, ride mechanics, and strategies. The first bit of news to come out of the expo comes from SeaWorld Entertainment, who brought an example of the rafts that guests can expect when the upcoming attraction Infinity Falls opens. Infinity Falls will posses the world’s largest river raft drop, 40 feet, and will take guests on an adventure with a team of scientists as they explore the rain forest. 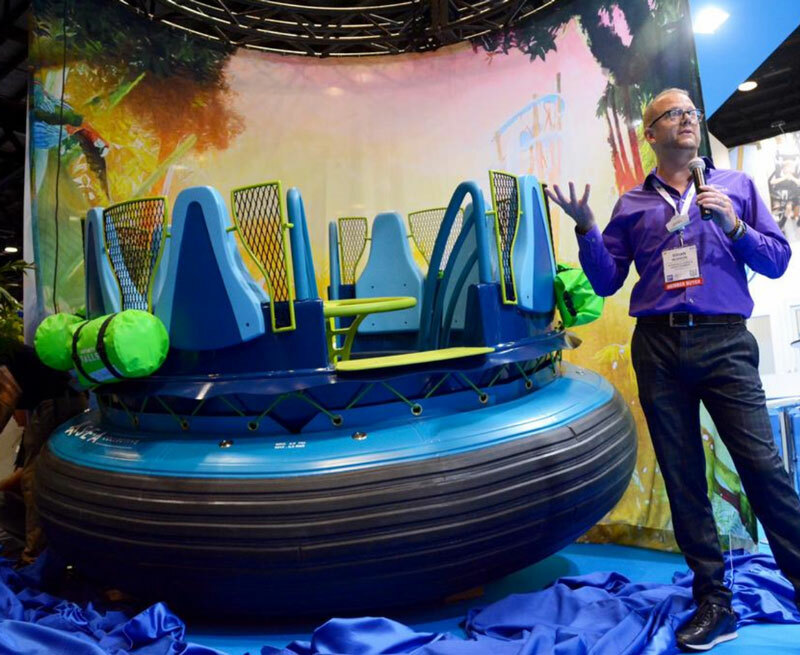 Orlando Business Journal spoke with Brian Morrow, SeaWorld’s senior vice president of experience design, who explained how the raft itself was conceived. SeaWorld announced new Sesame Street Parades coming to their San Antonio and San Diego Parks. They also spoke of a new Sesame Street-themed wooden coaster in Pennsylvania, and a virtual-reality coaster in Virginia. Frozen Ever After, Norway Pavilion, Epcot, Walt Disney World Resort, Orlando, USA (Attraction Reimagining) – Imaginatively and purposefully staged, this immersive journey is delivered with elegance, grace and beauty, using each twist, turn and backward falling moment to full storytelling potential. New-generation Audio-Animatronic figures plus projection, special effects, scenic design and soundscape/musical score all blend seamlessly to surround guests as they float through the world of Frozen. Pandora – The World of Avatar, Walt Disney World Resort, Orlando, USA (Theme Park Area Development) – Based on James Cameron’s 2009 blockbuster film “AVATAR,” the new, 12-acre land is a tour de force of placemaking: designed and built to be about the people, environment, culture, animals, and beauty of the Na’vi world. It is celebrated for its unparalleled level of detail and immersive qualities, touching all senses. Guardians of the Galaxy – Mission: BREAKOUT! Disney California Adventure, Disneyland Resort, Anaheim, CA (Attraction Reimagining) – This exhilarating new experience is based on Marvel’s “Guardians of the Galaxy” film franchise. Disney Imagineers met the challenge by creating a thrilling, immersive adventure with brilliant content choices, leveraging what people love about “Guardians” and bringing the popular movies authentically to life.